Archaeological Site Map Site Index Period Information and Background About the Project Elhaik Lab Subscribe to learn more! 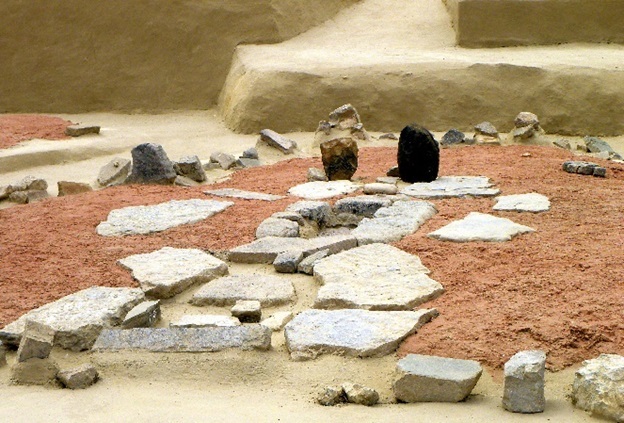 Reconstruction of a Stone Hearth at the Lepenski Vir Site . The Iron Gates region is a stretch of the Danube River that borders present-day Serbia and Romania near the Iron Gates dam that was built starting in the 1960s Surveys of the area found a series of major Mesolithic and Neolithic sites that were subsequently excavated through the 1960s and 1970s . These sites remained relatively unknown to Western archaeology for many years due to the political isolation of the region during Soviet times and subsequent conflict in the Balkans during the 1990s. It used to be thought that the Mesolithic in the Balkans was a time when a few scattered groups lived in the region. These people were quickly over-run by farmers who arrived during the Neolithic . The Iron Gates Mesolithic sites upended this notion with the presence of what appeared to be Mesolithic towns with buildings and evidence of complex architecture and monuments . Studies of bone chemistry from skeletons at the site has revealed that these people relied heavily on river fish while also hunting game during different times of the year . Archaeological evidence around the transition to the Neolithic has shown that there was more cultural continuity than had been expected with the transition, which occurred between 6,200 and 5,900 years ago . There is evidence that Mesolithic peoples had begun adopting the culture of arriving Neolithic farmers in the form of art, jewelry, and burial rites. The Lepenski Vir site, located 70 kilometers (43 miles) upstream of the Iron Gates Dam in present-day Serbia is the largest and most complex archaeological found in the region. Unearthed at the site were multiple houses that had hearths and plastered floors, as well as intricately carved stone and bone monuments . The site was used for thousands of years and more than 200 burials were found. The relative richness of the resources of the area meant that Mesolithic peoples were already living in permanent dwellings by the time Neolithic farmers arrived in the area . The four individuals analyzed in this sample from the Lepenski Vir site were carbon-dated to between 7,000 and 7,700 years old, placing them in the middle of the Mesolithic-Neolithic transition. There is some evidence that some of these individuals were non-local. One, was thought to be a 20-year old female was buried with Neolithic-style disc-shaped beads. She and another individual were also found to have tooth chemistry that showed that they grew up in a different region than around Lepenski Vir . Genetic analysis has found that these two individuals identified as non-local by tooth chemistry were closely-related to Anatolian farmers while the other two individuals were found to be descended from European hunter-gatherers . This plus the fact that they were buried in a Mesolithic tradition suggests that early farmers that came to the region were mixing with local hunter-gatherers and were not pushing them out as has been previous thought. Of the two individual with hunter-gatherer ancestry, there was one male and one female. The male came from the Y chromosome haplogroup R, which is a very ancient lineage that is thought to have arisen in Southeast Asia during the Paleolithic and is widespread throughout the world today . Its appearance predates the appearance of agriculture. Both of these individual came from the H mitochondrial DNA haplogroup, which appeared in the Paleolithic and has been found among ancient European hunter-gatherers . One of the non-local Neolithic farmers also belonged to this mitochondrial haplogroup, while the other belonged to the J2 lineage, which is another ancient haplogroup but is thought to have come from North Africa or the Middle East. The J2 lineage likely arose in the Middle East or North Africa around 45,000 years ago . The contents on this website are available under a CC-BY-NC license.